As all marketers will remember, the quest to improve user experience started way back in 2015, with the announcement it would be making refinements to its News Feed to strike a better balance between friends, public figures, publishers, businesses, and community organizations. That continued in the summer 2016 with more updates favoring friends and family content—and was still on the move when the first scandal broke later that year. Of course, these changes didn’t do marketers and brands any favors in the organic reach department. Organic reach had already been declining, and these moves have nearly eliminated its potential. And now, more changes have arrived, presenting new challenges as well as some opportunities. Below we share the low-down on five of such recent or rolling out changes, what they mean for social media marketers, and some potential next steps to take. Essentially, meaningful person-to-person interaction is what will carry the News Feed ranking weight, and person-to-page interactions will continue to be second tier. Oh, and Facebook expects people to spend less time on the platform. This sounds pretty scary for marketers. Most have adapted their strategies to zero-in on fostering engaging discussion, as well as throwing spend behind Facebook’s ad platform (which is also changing and we’ll get to that later). Working with influencers: With Facebook continuing to elevate content from individuals, there may be no better time to start building relationships with industry influencers and thought leaders that you can collaborate with on content. Facebook Groups: As my colleague, Nick Nelson, reported not too long ago, while groups have long been available as a feature on Facebook, the brand-driven “Facebook Groups for Pages” were just rolled out last year. And some brands are seeing traction with them, but this isn’t something you leap into without being thoughtful. Read: The Question on Many Marketers’ Minds: Should My Brand Start a Facebook Group? Facebook Stories: Very recently, Facebook insiders asserted that Facebook Stories may very well be the future of connection on Facebook. Once again, as Nick Nelson pointed out: “Facebook Stories are intriguing because they offer a real chance to capture part of a user’s attention — maybe even more than the minimum amount.” And early adopters may secure an advantage. As of late, most of Facebook’s critiques are a result of their advertising products and practices. By increasing the targeting capabilities of their advertising products, Facebook arguably put users’ privacy at risk. To help correct that perception and protect user privacy, Facebook is making several changes to their advertising platform. One such update was released in early July, requiring advertisers to state where they acquired people’s information for their custom audiences. Instead of simply uploading a list of emails you want to target as a custom audience, Facebook wants advertisers to take extra steps to ensure those emails came from a reputable source and that the audience has consented to those ads. With this change, Facebook hopes to improve transparency with users about why they see ads from certain brands and how they received their information. From our perspective, this is good news. Consumers are increasingly wary of marketing and advertising messages and this move can help strengthen the credibility and relevance of your ads and brand. Of course, this is all assuming you can and do confirm your custom audience lists and sources fall within the new guides. Now more than ever, people want control over their data. They want to know what information is stored, who has access to it, and they want to be able to delete it. Recognizing this need, Facebook announced a new feature called Clear History that will be released “soon.”With this new feature, Facebook is giving users the ability to see the websites and apps that store information with Facebook, and delete that information from their account. However, Facebook will still retain aggregated analytics, but no personally identifying information will be contained. “We’ll still provide apps and websites with aggregated analytics – for example, we can build reports when we’re sent this information so we can tell developers if their apps are more popular with men or women in a certain age group,” Facebook says. “We can do this without storing the information in a way that’s associated with your account, and as always, we don’t tell advertisers who you are. What exactly does this mean for marketers? If you use Facebook plugins on your website (think Facebook Pixel or “Like” buttons on websites), your audience can now see and delete the information that the plugin collects; meaning it won’t be connected to their profile any longer. Obviously, if users take advantage of this when it rolls out, clearing their history could be problematic for marketers, and maybe even users. For marketers, it will be incredibly difficult to target these folks with ads. For users, that could mean an uptick in irrelevant ads for a time. However, the eventual upside for advertisers could be the “re-learning” that needs to happen after a history cleanse, which can lead to a more relevant and accurate look of who your audience is. A poor customer experience really sours your impression of a brand. An to ensure that ads on Facebook lead to positive shopping experiences, and not negative ones, Facebook will now ban brands that have low customer satisfaction ratings from advertising on their platform. For example, if users give you too many frowning faces shown in the rating system below, Facebook will reject your ads. So, even if you receive negative ratings, you will have an opportunity to make improvements to prevent being banned. The opportunity here is obvious. The better customer experience you provide, the more successful your marketing efforts will be. For Facebook ads, this is rooted in focusing on clarity and honesty within your ads. At a minimum, Facebook suggests taking steps to ensure your ads aren’t misleading. In addition, use images or videos to make it very clear what you are selling and what you are selling it for. It’s also a good idea to set clear expectations for how users will receive your product or service. By setting clear guidelines, you’re more likely to meet customer expectations, leading to more positive user ratings. For more insight, read Facebook’s tips on how to improve customer feedback. Knowing the organization behind an ad is important. Otherwise, users might not trust the content of the ad. So, to increase ad and page transparency, Facebook now allows users to see all of the ads any page is running within their partner network. This includes ads on Instagram, Messenger, and the rest of the Facebook partner network. In addition, even if pages aren’t advertising, Facebook will provide more information about a page including name history and the date the page was created. Together, these changes aim to give users more information about an organization so they can decide if an ad is credible or not. For marketers, this change isn’t a bad thing — it may even mean more eyeballs on your advertising content. However, marketers should still be thoughtful about how their ads will be perceived by individuals outside of their target audience. For example, even if an ad isn’t specifically designed for or served to them, users can still review (and report) your ads. As a result, you need to take extra steps to make sure your ads are consistent, clear, and friendly for all. Long before the scandals and latest privacy concerns, Facebook has been rooted in evolution. Just think what the platform started as and has become. So, while the recent and coming changes seem pretty fierce, I think it’s safe to say we were already on that trajectory. And there’s probably more to come. Since the major changes that impacted advertisers and brands began rolling out in 2015, Facebook has maintained their actions are all in the interest of creating a better user experience. And at the end of the day, that’s what the goal of any marketer is in their quest to nurture their audience and aid them on their customer journey. So, it’s OK if you’re a panicked, disheartened, or simply irritated. But, at this point, the platform still holds marketing opportunity, marketers just need to adapt their social media marketing strategies, try new features and avenues, and work hard to ensure they’re part of providing that great user experience. Looking for more social media marketing news, tips, and insights? Check out all of our recent social media-related blog posts. 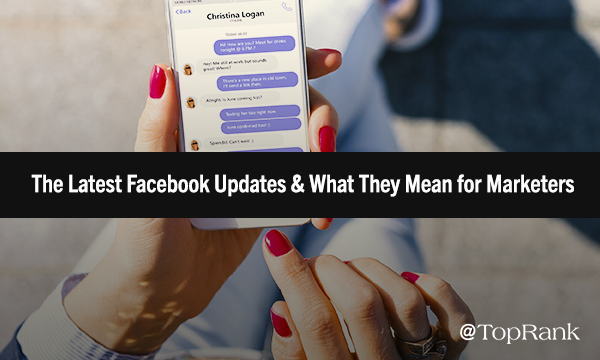 The post The Latest Evolution of Facebook: The Marketing Low-Down on 5 Recent Changes appeared first on Online Marketing Blog – TopRank®.